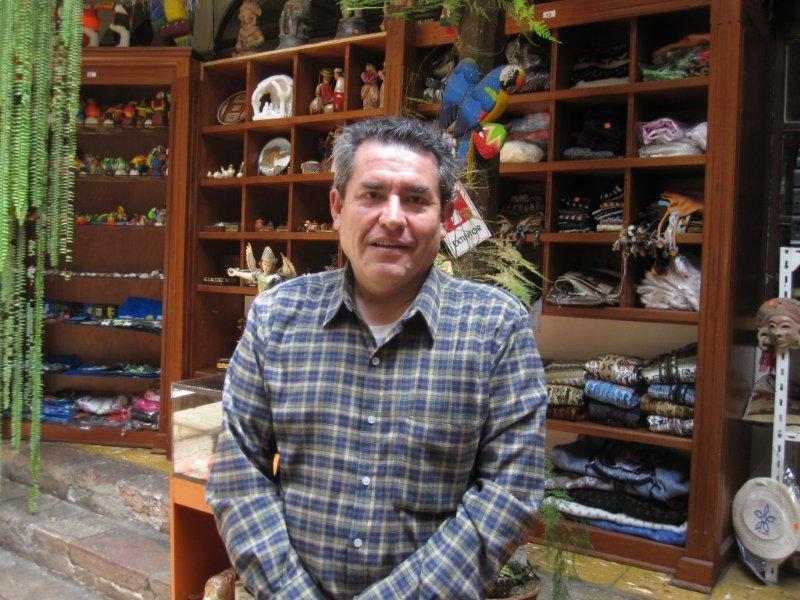 Here in Cuenca there are so many charming shops with souvenirs and unique handmade objects. We were in one on Thursday and I thought I would share it with you. What I love about these shops is that they are tucked away all over the city in old colonial homes that have been converted into unique places of business. These hidden treasure troves don’t usually stand out because the store front is simply a large open wooden door. As I’m walking by I look in and see a narrow hallway full of brightly colored masks, jewellery or knitted clothes. The hall opens into a spacious room illuminated by natural light streaming down from an open sealing. This larger room is also full of different kinds of crafts made of leather, ceramic, knitted, painted, dyed, woven, carved, and inlay-ed materials. 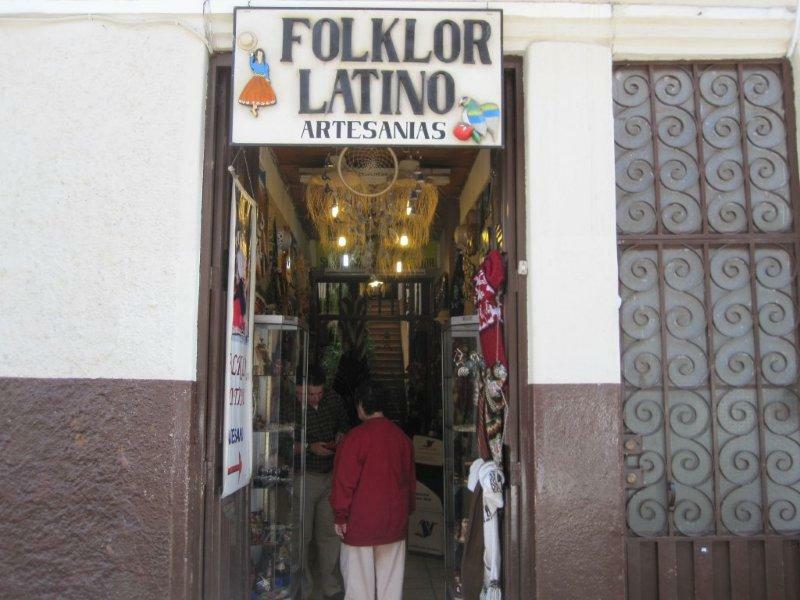 Here’s how to get in touch with Folklor Latino Artesanias here in Cuenca. Owners are husband and wife team of Francisco Lopez Cisneros & Irlanda Prado P.
Address: Simon Bolivar between Padre Aguirre and General Torres. I was not used to these types of shops or homes back in Canada. In Canada the outside is outside, but here there is often an open air courtyard in the center of the building and there is something about that I really enjoy. There are often plants, and flowers along with a fountain. In cafes and restaurants there is the option of eating inside, or inside/outside in the courtyard. I enjoy the inside/outside option, the plants and natural light add a garden type atmosphere, it’s cool to eat or shop in a private garden in the middle of the city. I have yet to meet a shop owner that isn’t friendly and very helpful. If you know a little Spanish, they always want to find out where you’re from, why you’re here and are more than happy to explain how their interesting items are created. Visiting local artisans is something I love about traveling around Ecuador. I’m thinking of moving to Cuenca, permanently, within the next year and am reading all I can find about what I can expect of the life there.